With a physical and mental training of several months Marina Abramovic prepared herself to be able to concentrate herself for 3 months, 6 days a week, 7 ½ hours a day, on the visitors who would come to sit before her. This performance was part of the exhibition that the Museum of Modern Art in New York devoted to her work in 2010. The exhibition was called The Artist Is Present. In spite of or maybe thanks to the negative media attention for her controversial art, 850.000 visitors came to see her. People slept in the street in front of the museum. At closing time a new line started to form itself for the next morning. The guards were so impressed that after working hours they also joined the line. The reactions were stunning. People were touched by the sheer possibility that there was someone who would look deeply into their soul without word or movement. Who would only look and listen, without concern for time, without any special reason and without condemnation. The ‘clean slate aspect’, it was called by one of the visitors. Abramovic created serenity, stillness and harmony by focusing her full attention on the other. The gift of time and attention has become a scarce commodity in our culture. Like me!, thousands of messages and advertisements scream at us every day. Sometimes an artist succeeds in holding up a mirror to the time we live in, searching for an answer together with those who pass by. Sometimes they even find one. Abramovic understood what people of the 21st century need: unique, clean, personal contact – one person being present for the other. And art was transformed into the art of living. Love translates itself into time and attention! 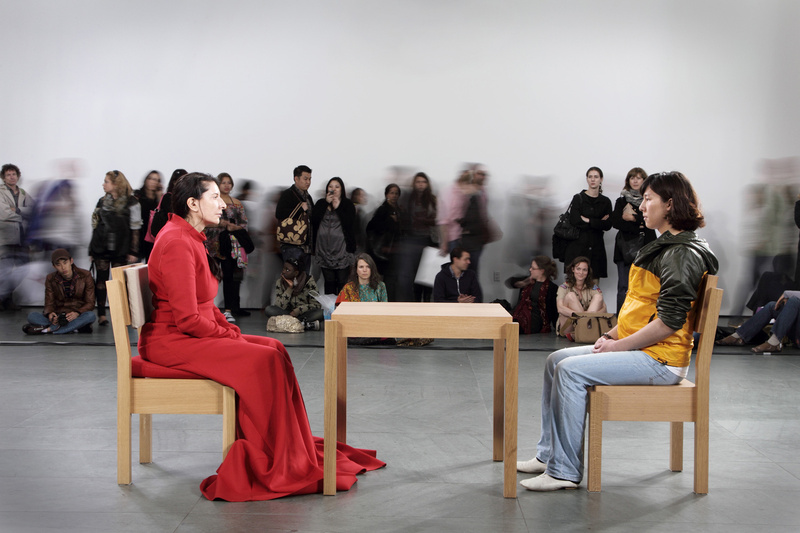 Marina Abramovic, The Artist Is Present, performance Musem of Modern Art, New York, 2010. Marina Abramovic (1946) is a Serbian performance artist who began her career in the early 1970s. Her work explores the relationship between the performer and the audience, the limits of the body and the possibilities of the mind. From March 14 to May 31, 2010, the Museum of Modern Art in New York held a major retrospective and performance recreation of AbramoviÄ‡'s work, titled ‘Marina Abramovic: The Artist Is Present’. This was the first retrospective exhibition of only performance art at MoMA, and at the same time one of the most successful exhibitions ever in the history of the museum. For more information, seewww.moma.org/interactives/exhibitions/2010/marinaabramovic. Anikó Ouweneel-Tóth is a cultural historian and art consultant. She studied English Literature and Linguistics and Finnish Culture and Language in Budapest, Hungary. Later she studied Cultural Heritage at the University of Utrecht in The Netherlands. She took part in the international project ‘Converting Sacred Spaces’ which was commissioned by the Museum Catharijneconvent in Utrecht. In her work she focuses on contemporary art and artists. It is her passion to create incubators and platforms in which art and inspiration for life reinforce each other.